Bracken Hall House B&B01274 590151work Bed & BreakfastBracken Hall House has been recently renovated to a high standard with five luxurious and individually styled rooms. We offer a peaceful residents lounge and light airy breakfast room, both facing the garden and to Shipley Glen itself. 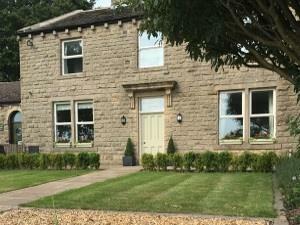 We are ideally located for visits to Saltaire, Ilkley, Haworth and Skipton but also accessible via train to Leeds and Bradford. We are an ideal base to relax and unwind in a rural setting. Cycle storage available. Cycling and walking routes run directly past the B&B (on Millennium Way). Close to historic Victorian tramway and Saltaire World Heritage Site steeped in history.